Sickle Cell Disease, SCD is a group of inherited red blood cell disorders. 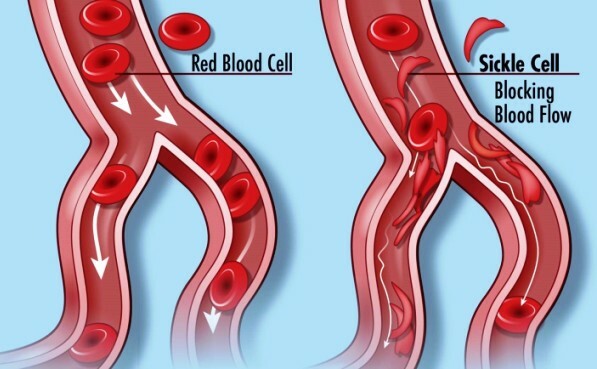 Healthy red blood cells are round and they move through small blood vessels to carry oxygen to all parts of the body. In someone who has Sickle Cell Disease, the red blood cells become hard and sticky and look like a C-shaped farm tool called a "sickle". The sickle cells die early, which causes a constant shortage of red blood cells. Also, when they travel through small blood vessels, they get stuck and clog the blood flow. This can cause pain and other serious problems such infection, acute chest syndrome and stroke. People who have this form of SCD inherit two sickle cell genes ("S"), one from each parent. 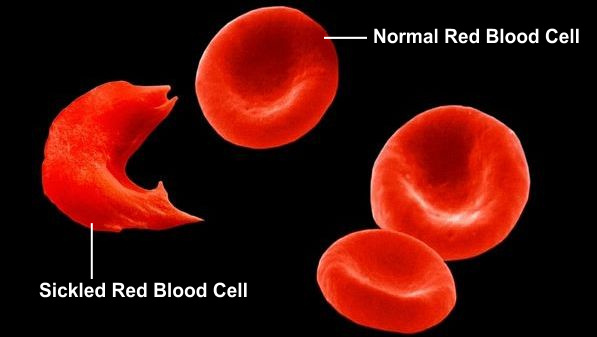 This is commonly called sickle cell anemia and is usually the most severe form of the disease. People who have this form of SCD inherit a sickle cell gene ("S") from one parent and from the other parent a gene for an abnormal hemoglobin called "C". Hemoglobin is a protein that allows red blood cells to carry oxygen to all parts of the body. This is usually a milder form of SCD. People who have this form of SCD inherit one sickle cell gene ("S") from one parent and one gene for beta thalassemia, another type of anemia, from the other parent. There are two types of beta thalassemia: "0" and "+". Those with HbS beta 0-thalassemia usually have a severe form of SCD. People with HbS beta +-thalassemia tend to have a milder form of SCD. People who have these forms of SCD inherit one sickle cell gene ("S") and one gene from an abnormal type of hemoglobin ("D", "E", or "O"). Hemoglobin is a protein that allows red blood cells to carry oxygen to all parts of the body. The severity of these rarer types of SCD varies. People who have SCT inherit one sickle cell gene ("S") from one parent and one normal gene ("A") from the other parent. This is called sickle cell trait (SCT). People with SCT usually do not have any of the signs of the disease and live a normal life, but they can pass the trait on to their children. Additionally, there are a few, uncommon health problems that may potentially be related to sickle cell trait. SCD is a genetic condition that is present at birth. It is inherited when a child receives two sickle cell genes - one from each parent. The reason that infants don’t show symptoms at birth is because baby or fetal hemoglobin protects the red blood cells from sickling. When the infant is around 4 to 5 months of age, the baby or fetal hemoglobin is replaced by sickle hemoglobin and the cells begin to sickle. SCD is a disease that worsens over time. Treatments are available that can prevent complications and lengthen the lives of those who have this condition. These treatment options can be different for each person depending on the symptoms and severity. Hydroxyurea is a medicine that has been shown to decrease several complications of SCD. This treatment is very safe when given by medical specialists experienced in caring for patients with sickle cell disease. However, the side effects of taking hydroxyurea during pregnancy or for a long time are not completely known. Bone marrow is a soft, fatty tissue inside the center of the bones where blood cells are made. A bone marrow or stem cell transplant is a procedure that takes healthy cells that form blood from one person - the donor - and puts them into someone whose bone marrow is not working properly.